FEBRUARY 16, 2013: This week, Governor Deval Patrick filed a legislative proposal that would significantly change healthcare benefits for future retirees, while grandfathering and protecting current retiree benefits from knee-jerk changes in contribution percentage rates. FEBRUARY 1, 2013: In the 18-months since the passage of Chapter 69, Acts of 2011, cities and towns have saved an estimated $250 million in health insurance costs. Known as Municipal Healthcare Reform, Chapter 69 paved the way for municipalities to increase copayments and deductibles up to the level set by the state’s Group Insurance Commission (GIC). It also allows for cities and towns to join the GIC, if the state plan can provide additional savings. JANUARY 22, 2013: When Governor Deval Patrick files his FY 14 Budget proposal on Wednesday, it is not expected to contain legislation to reform retiree healthcare. Observers now anticipate a stand-alone bill to be filed in late January or early February that mirrors the report filed by the Special Commission on Retiree Healthcare, issued in December. JANUARY 11, 2013: Governor Deval Patrick has endorsed a report by the Special Commission on Retiree Healthcare that makes significant changes to public retiree healthcare benefits for future retirees, but not for current retirees. BOSTON – Friday, January 11, 2013 – Governor Deval Patrick today announced plans to file legislation to reform health insurance benefits for retirees that would save as much as $20 billion for the Commonwealth and municipalities over the next 30 years. Today’s announcement builds on the Governor’s record of reform and his Administration’s commitment to fiscal responsibility for the long-run. STATE HOUSE, BOSTON, DEC. 20, 2012….State and municipal employees would have to wait until they are older and put in more years of service to qualify for retirement health benefits under a proposal being embraced by the Patrick administration to cut future benefit costs by $20 billion over the next 30 years. DECEMBER 20, 2012: Following nine months of lengthy meetings, detailed analysis and intense negotiations the Special Commission on Retiree Healthcare completed its work today with an 11-1 vote to endorse a proposal that, if passed into law, will save Massachusetts taxpayers at least $15-$20 billion over the next thirty years. 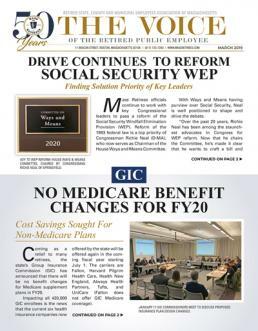 DECEMBER 3, 2012: After more than eight months of meetings and analysis, the 12-member Special Commission on Retiree Healthcare is now in the process of drafting its report and finalizing its recommendations.